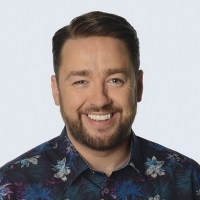 Jason Manford is a mult award-winning English stand-up comedian, writer, presenter, actor and former XFM radio DJ. He has been a regular panellist on "Would I Lie To You?" and won the 2006 Chortle Award for Best Breakthrough Act. He presented the TV show, "Show Me The Funny" in 2011 and has also hosted "Sunday Night at the Palladium" as well as BBC's The One Show. In 2015, he starred in the first series of the BBC drama, "Ordinary Lies", playing the role of Marty McLean.